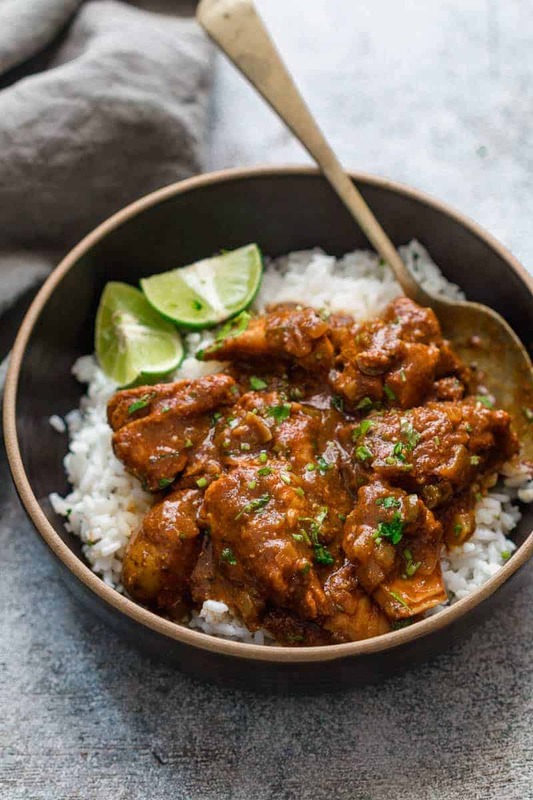 This slow cooker chicken curry is perfect in every way – juicy pieces of chicken, a spicy, flavourful gravy that has the right consistency – this is the perfect dinner to come home to. Alright! So who is with me when I say slow cookers are awesome? Especially when you have recipes where you can dump a whole lotta stuff in and after a few hours, you are left with plain deliciousness. Enter: Slow Cooker Chicken Curry. Here’s the thing. I have always had a little bit of a problem with chicken cooked in a slow cooker. Which is why you won’t find any slow cooker chicken recipes on the blog. Because most recipes I’ve tried result in dry or over cooked chicken, or a lot of water in the dish. This recipe took a few tries but I’ve got it exactly the way we like it. Tender, juicy chicken, a gravy that coats each piece of chicken instead of pooling at the bottom and so much flavour that you would think we marinated the chicken for a few hours. And it’s really simple to make. The only real cooking you’ll do here is to cook the onions and garlic together in a little oil before adding it to the slow cooker. And the only reason I recommend doing that is so that we can get rid of the raw, overpowering taste of onions and garlic; and take advantage of their sweet flavour once we cook them. The rest of the recipe is really dump and cook. We are using some really simple ingredients to flavour this chicken curry. I love adding whole spices like bay leaf, cloves and whole black pepper in the recipe in addition to garam masala because the whole spices really infuse flavour in this recipe. But if you don’t have them, feel free to skip them and increase the garam masala by 1/4 teaspoon. 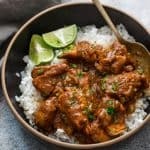 This slow cooker chicken curry will not disappoint. Its packed with flavour and you can watch how easy it is in the video below. Watch Recipe Video above. 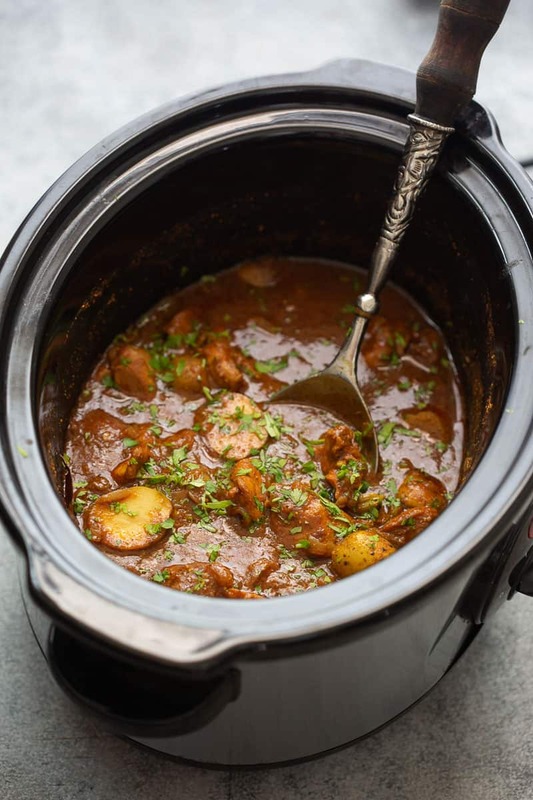 This slow cooker chicken curry is inspired by Indian flavours and is the perfect dinner recipe. The chicken is juicy, the gravy is luscious and not watery, and its fantastic served with rice or naan bread. It’s incredibly easy, with minimal prep, while being gluten free and kid friendly too. Heat oil in a pan and add chopped onions and minced garlic. Saute for 3-4 minutes till the onions soften. Transfer this mixture to the slow cooker along with all the other ingredients. Mix well. Cover and cook on high for 3.5-4 hours or low for 6 hours. Once the chicken curry is cooked, mix in the chopped coriander and serve hot on top of steamed rice or with some butter naan. Chicken Thighs vs. Breasts: I recommend chicken thighs for this recipe because they don’t dry out and retain their juiciness in the slow cooker. You can also use bone-in chicken thighs for this recipe. If you insist on using chicken breasts, keep them whole and once the curry is cooked, use a fork to shred the chicken in the slow cooker. Butter: Butter adds an extra layer of flavour and the fat keeps the chicken curry from drying out. You can also stir in some cream or coconut milk in the end in this recipe. Spices: The blend of coriander powder, turmeric, chilli powder and garam masala is powerful, and adds tons of flavour. Chilli powder can be swapped with paprika or cayenne pepper in this recipe. You can also swap these spices for two tablespoons generic curry powder. Looks yummy. I don’t have slow cokker but i have instant pot. Can i cook thisnin instant pot in slow cook mode and how long I should keep it and pressure level? Hi Richa, this recipe looks amazing and I will try it. But I do have some friends that prefer a milder curry, would this be classed mild or medium hot? Hi Richa. Your recipe sounds great. One question: should the chicken be browned as well as the onion and garlic before the slow cooking process? Hey Maryanne – there is no need for that. You can add the chicken pieces straight to the slow cooker and they’ll cook in the sauce. 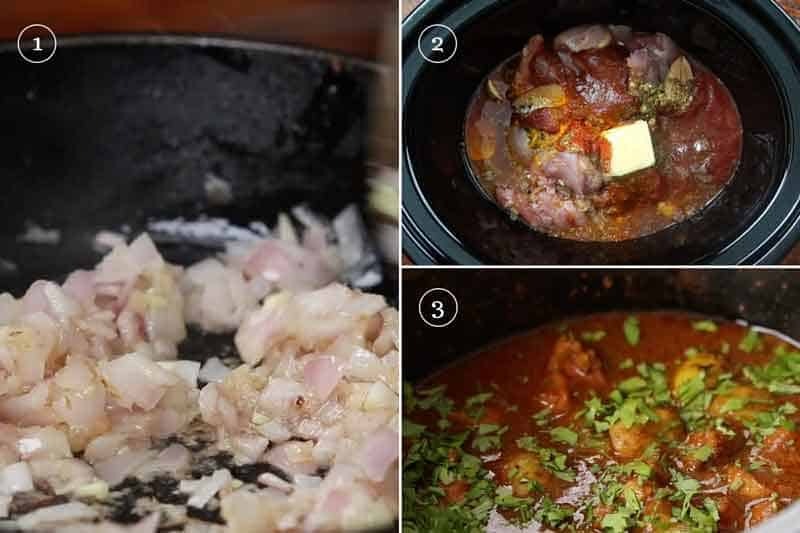 In a slow cooker it was very tasty and easy to cook Thank You. So glad you liked it Darren! Dear Richa, how many grams of chicken does the recipe call for? This was extremely well flavored. Very delicious. I used the spices as recommended in the recipe. I used a medium jalapeno including the pith and seeds. It was a little bit spicier than I prefer, but definitely tolerable. Husband loved it. Thank you for sharing this recipe. Maybe you can remove the seeds from the jalapeno the next time and that’ll help reduce the spice levels. So glad you and the hubs liked it. What kind if tomato puree did u use. Fresh or store bought if store bought could u tell brand or what kind? Really loved your recipe. I am a huge fan of chicken and am always in the lookout for such toothsome chicken recipes. Your just made my day. Thanks for sharing! What can I substitute for tomato puree? The slow cooker function on the instant pot doesn’t work very well. If you want to try this in the IP, just pressure cook it for 10 minutes. Hey Gayathri, the ‘crockpot’ brand is really good and is available on Amazon. You can check that out. I personally have a basic Russell Hobbs. Thats awesome Amanda! So glad both of you liked it! Looks like a perfect meal for fall nights! Thanks Toni, its pure comfort food! Love all the wonderful spices, especially the coriander! YUM. Fantastic flavors. I bet the house smells amazing too! Absolutely love chicken curry. This looks so so good! !